History of Schwenksville’s “Pizza Restaurant”, now with So Much More! From the Journal of Helene Moccia, mother of Matt, Steve and Jon. How did the time go by so quickly? When Matt and I opened the doors to The Train Stop, we were young, ambitious entrepreneurs. No experience, 3 little sons and no money. But, we knew our little town needed a restaurant and we were willing to give it a try. Although our loving, widowed neighbor loaned us $35,000 (with no interest!) we soon learned how expensive a start up was and learned to make money by saving money. Our equipment was bought through barter and trade. The first slicer arrived after Matt traded it for a truck bumper. Ice came from what we made at our home. And I scoured old & used shops to find an antique cash register so that I could actually “ring up” customers. At first, Matt couldn’t afford to quit his job as a milkman for Abbott Dairies. He worked 17-hour days for over six months until he cautiously decided we could live on Train Stop revenue. I got up, got the kids off to school after doing the laundry, opened the restaurant and stayed till closing. Matt’s father lived with us, so he became the official lunchmeat slicer. He also became the official Genoa salami sandwich eater, consuming 5 of them every day! As the years raced by and our sons grew older, they learned the restaurant business in between studies and sports. The business had grown from a mom and pop sandwich shop, to a very successful corporation. We had grown out of space, and the boys wanted us to expand in order to continue to grow and be able to support four families. So expand we did. In 2001, we built a brand new place one mile up the road. 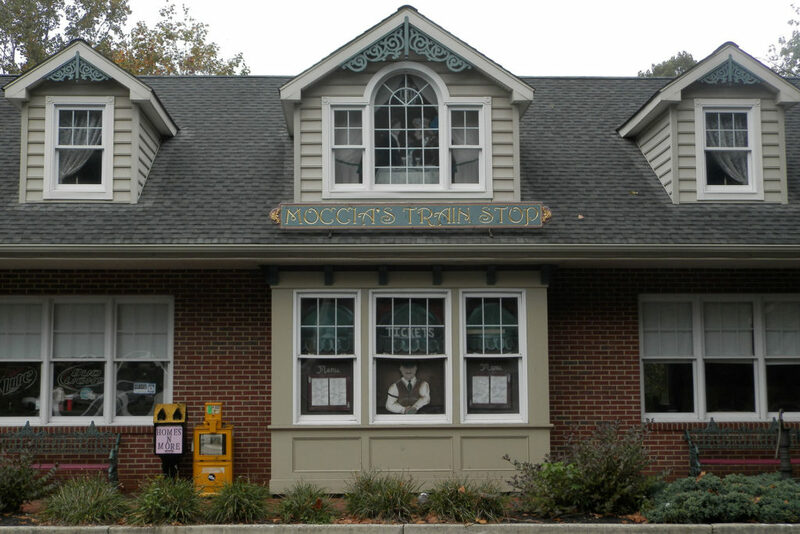 The name stayed the same and we renamed the original Train Stop location The Main Street Station Eatery. There we now serve breakfast, lunch and lots of ice cream. 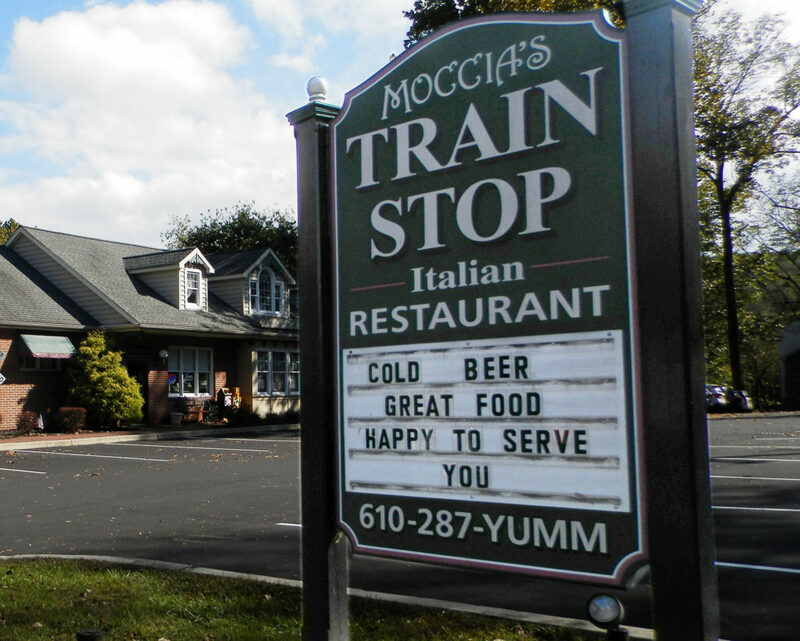 The new Moccia’s Train Stop is now well established. Our sons, their wives, and our 10 grandchildren all share in the responsibility of running a restaurant. Scores of teenagers have come and gone as employees. It has witnessed seven presidential elections, two wars, a stock market crash, a recession, three family car accidents, been involved in two boycotts, two IRS audits, one house fire, and six break-ins! In 2005, Matt and I retired. We handed the business over to our sons with pride, and knew they would create many more successes. And, hopefully, allow their children to do the same. So from seating for six and serving a tasty sandwich in 1981, to seating 100 customers enjoying pasta, seafood, apps and desserts all at one time in 2011, I have to say Matt and I are extremely proud, lucky and blessed. 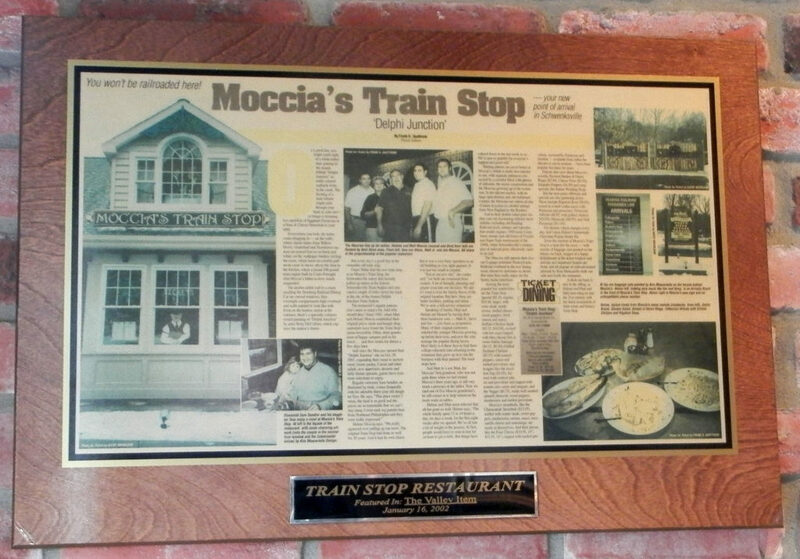 We want all our customers to know we will continue the tradition of fresh, honest, Italian food for as long as there is a Moccia. And I love knowing we still use Grandma Moccia’s homemade pasta sauce recipe.